On Thursday, August 23rd, PBA Galleries will host a sale of Americana & the Mexican American War – Travel & Exploration – Cartography of over 700 lots of historically important material from the 18th through 20th centuries, covering the exploration, settlement, civilization, and cultural transformations of the Americas and the world at large, and also the wars and battles that are ever present. The offering contains books, photographs, maps, documents, letters, manuscripts, items signed by United States Presidents, ephemera, and more. 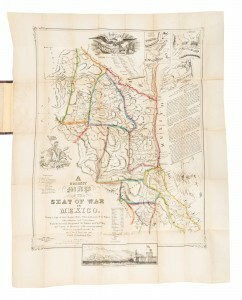 Included is a large collection of printed and manuscript items relating to the Mexican-American War of the late 1840’s, in which the United States wrested large swathes of territory from Mexico, what is now the Southwest. The sale will offer a number of lots pertaining to the Mexican-American War including the official printing of the “secret” version of the Treaty of Guadalupe Hidalgo, which was under consideration by the U. S. Senate. Although the treaty was signed in February 1848, its provisions were kept secret while the Senate debated its ratification. This treaty gave the U. S. an addition of land equaled in size only by the Louisiana and Alaska purchases (Estimate: $2,000-$3,000). Also of interest to Mexican-American War collectors is second most important map of the war, A Correct Map of the Seat of War in Mexico, 1847. It is a copy of the map captured from General Mariano Arista at Resaca de la Palma, with additions and corrections. Visually, this map is among the liveliest Mexican-American War images, depicting Manifest Destiny in full-tilt cartographical mode (Estimate: $1,500-$2,000). Oregon and California in 1848, by J. Quinn Thornton, published in two volumes in 1849, is an important early work on the California gold fields. This first edition contains a folding map by J. H. Colton, Map of California, Oregon, Texas, and the Territories adjoining with Routes &c. It also gives the first lengthy account of the Donner tragedy (Estimate: $2,500-$3,500). 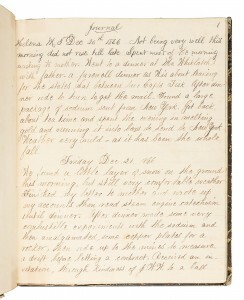 Another lot where California is featured is an original order book from R.J. Waters & Co., with some 182 gelatin silver photographs of sights and scenes in San Francisco from the mid-19th to the early 20th centuries. The images show the growth and evolution of the city from its earliest days (Estimate: $3,000-$5,000). Two lots signed by American icons are also featured. The first, an engraved military appointment on vellum, was signed by Abraham Lincoln on March 22, 1865, less than a month before he would be assassinated by John Wilkes Booth (Estimate: $5,000-$8,000). 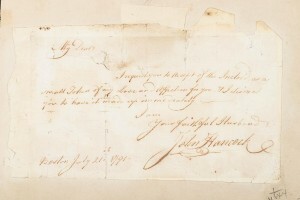 The other is an affectionate autograph note from John Hancock to his wife, in 1791, presenting a “Token of my Love and Affection,” boldly signed (Estimate: $3,000-$5,000).